The exhibition “A Creation of Our Time. The Debate over the Norwegian Parliament Building 1835-1860″ was officially opened at AHO on Tuesday December 16 by the President of the Norwegian Parliament, Olemic Thommessen. 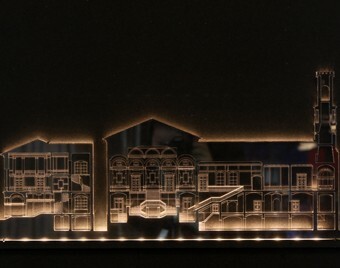 The exhibition shows relief models of six of the most contested projects for the Norwegian Parliament building, made between 1856 and 1860. In addition, the exhibition catalog gathers all drawings made for a Norwegian Parliament building between 1835 and 1860. The exhibition is the result of the Printed & Built studio Architecture on Display, and it was produced by master students Iselin Bogen and Ole Knagnehjelm Lysne, supervised by Professor Mari Hvattum. Originally posted Feb 28, 2015. Latest revision Nov 30, 2017.